Compliment your therapies with award-winning, certified organic products and rituals. We provide professional sizes, dedicated support, easy ordering and training. Designed for smaller businesses, home-based or mobile therapists. Click here for more information on how to apply for a therapist account. Designed for Salons and spas with more than one treatment room, and a retail area. Click here for more information. 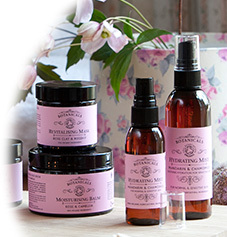 Lucy is one of an increasing number of professional therapists who use Botanicals. Here's what she says about them: "Did my first mini botanicals facial yesterday and the client was ultra-relaxed and has text me this morning to say her skin is still plumped up and feels fab!! So pleased :)"
Here's another recent comment from professional therapist, Sue: "This is a wonderful product, made up of amazing essential oils that whisk the client away on a "fluffy pillow of relaxation". My clients love it and have started to ask for supplies of it as an in-between self-applicable skin conditioner. Fab, fab, fab. Thanks"